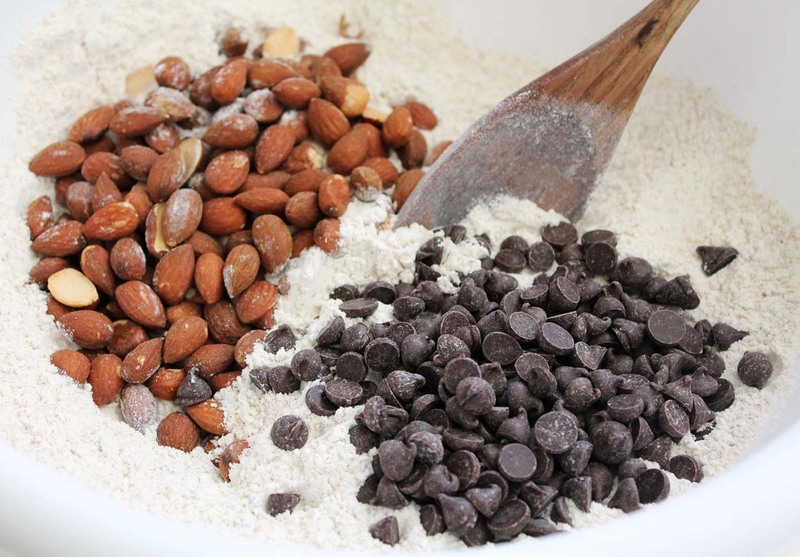 Almond Carob Chip Cookies | Live. Learn. Love. Eat. The other day I was making cookies (I know, what else is new?). I usually make chocolate chip cookies every few weeks because those are a family favorite and so I always make sure that our freezer is stocked with them. My husband likes to take them to work to have on his coffee break and of course the kids love chocolate chip cookies too. 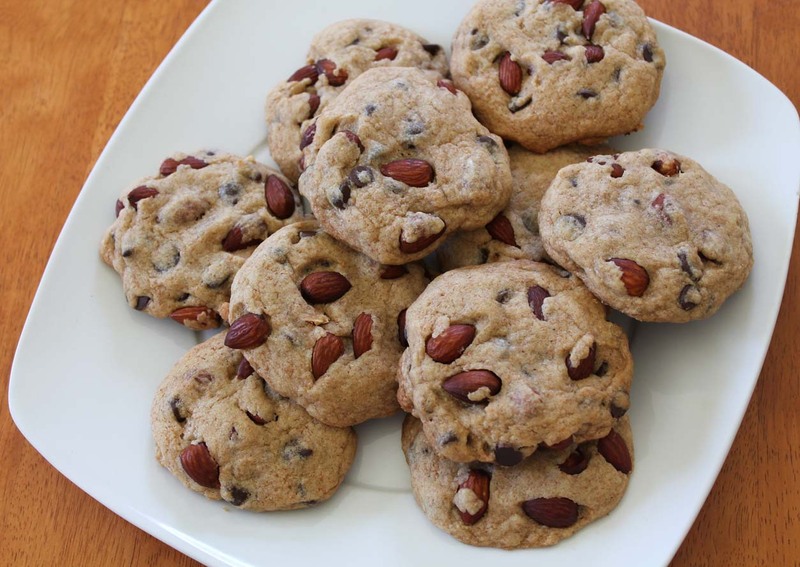 This time instead of plain chocolate chip cookies, I decided to use carob chips and throw in some roasted almonds. I have since made these cookies two more times. These are my new favorite cookies! If you haven’t ever tried carob chips before, I suggest giving them a try! I love the taste of the carob chips compared to chocolate chips. For more information on carob chips see this link. Of course, good old dairy-free chocolate chips will do just lovely too. 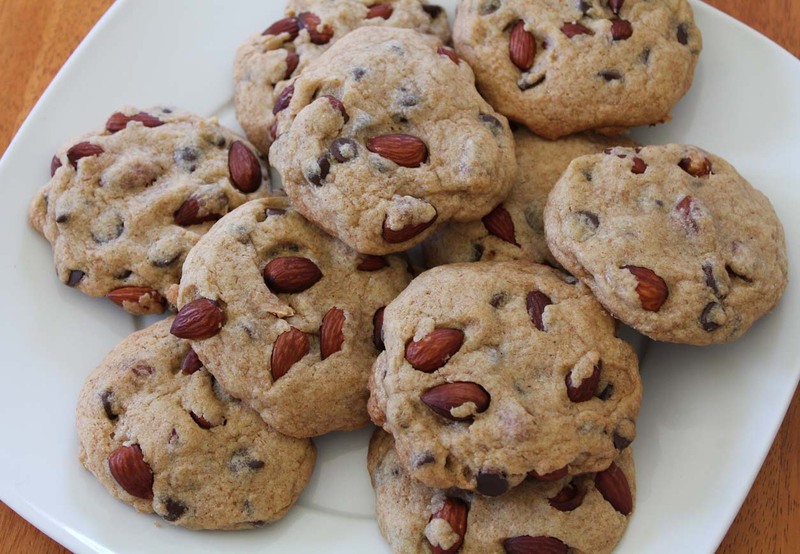 A healthy, whole wheat, naturally-sweetened cookie loaded with crunchy roasted almonds and sweet carob chips. In a large bowl, combine the flour, baking soda and sea salt. 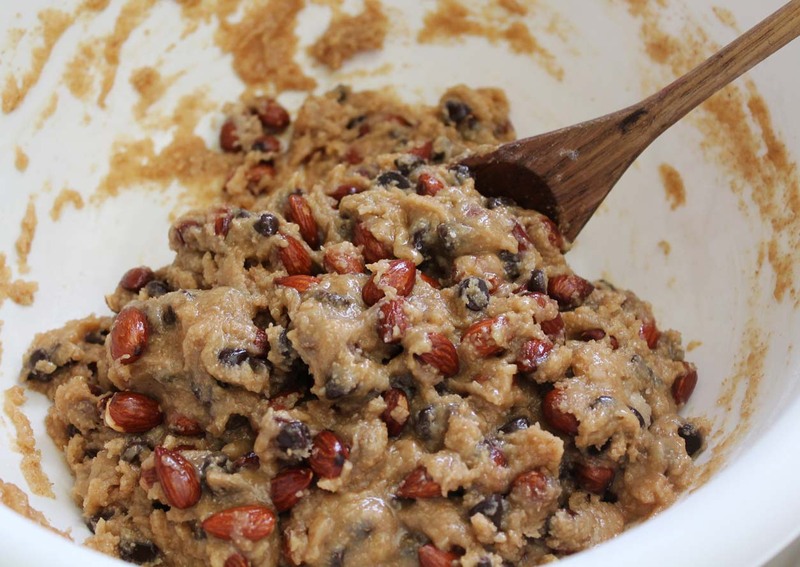 Add the almonds and carob chips. Add the maple syrup, oil and vanilla and mix until combined. Form the dough into table-spoon size balls, place onto the baking sheet and press down slightly. Bake one batch at a time for 8-10 minutes, until very lightly golden. Allow to cool completely before removing from the pan. 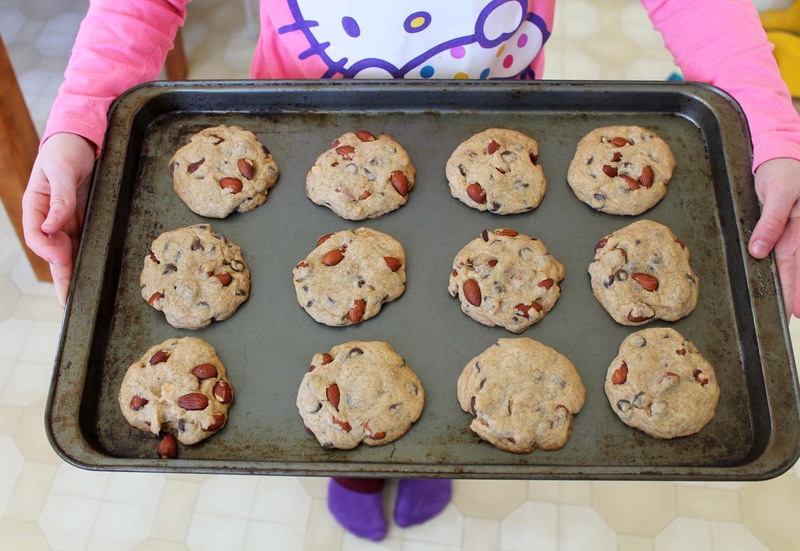 If you love my chocolate chip cookie recipe, then you are sure going to love these too! Okay those look down right delicious!!! Can you say yum?! Seriously, I love all of these ingredients and so healthy. You just keep inspiring me! I should not have chocolate but I keep sneaking it in to my mouth. This post has made me want to try carob chips. Thanks for the recipe and healthy inspiration! These carob almond cookies look divine! Yummmm! Those cookies look delicious!… I love carob chips, but have had a nearly impossible time finding ones without dairy. Where do you get yours? I get mine at an organic store in the bulk section. They said that they were vegan. There are also some vegan brands, like SunSpire, which you can order online. I am sure others must be too, if you read the labels and there is no milk in them. Same with chocolate chips, lots of brands are actually vegan and contain no dairy. Pingback: Weekly Meal Plan and Food Preparation | Live. Learn. Love. Eat. Pingback: 15 Favorite Vegan Snacks And Sweet Treats | Live. Learn. Love. Eat. Pingback: Monday Meal Plan | Live. Learn. Love. Eat.